In week three it’s usually all over. I’m talking about that list of goals I made on January 1st, maybe you made one too? Whether in your head or on paper, new years resolutions can get lost in the shuffle. I mean starting a new exercise routine, losing weight, eating better, starting a new business or side hustle, learning something new, you name it, all these things can be quite intimidating and scary, so much so we stop before we even get started. Last week I had the chance to hear a talk that was being held at Body Business, the gym where I’ve taught for almost 20 years. Stacey Vicari, life strategist of Ideal Life was talking about living a life of “Passion, Purpose & Power”, focusing on motivating and inspiring us to make immediate and positive changes in our lives. What do you dream of doing or having? 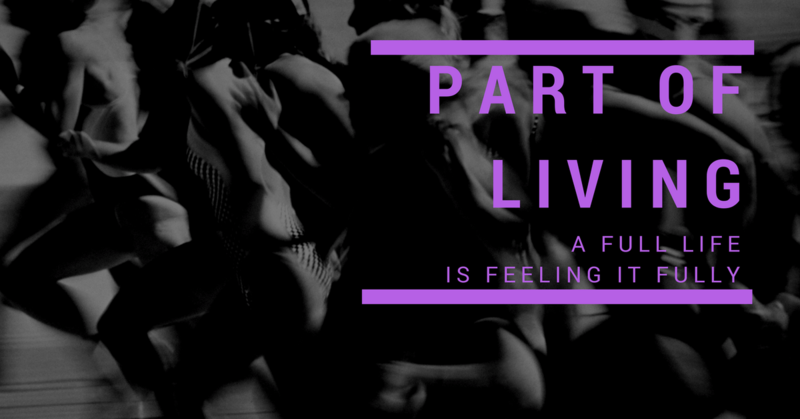 What makes you feel passionate? How do you want your relationships to look and feel? Once we wrote the answers down, she talked about having balance in everything, noting that it’s not about checking off all the boxes in life. It’s more about centering our focus and our thinking on what’s important and what we’re after, rather than what we don’t have and why we don’t have it. What’s standing in the way of obtaining your goals or fulfilling your dreams? What fears or insecurities do you have? What in our life presents a challenge to you in fulfilling your goals? In today’s world we define success as accumulation. We really can’t have enough of things like accolades, stuff, and money. They all add up to our self worth. On top of getting more, more, and more, we feel we need to show it all to the world; where we are, what we’re doing, and all that we have accumulated. Strangely we feel better doing so. Then came the ‘aha moment’ of the talk for me. 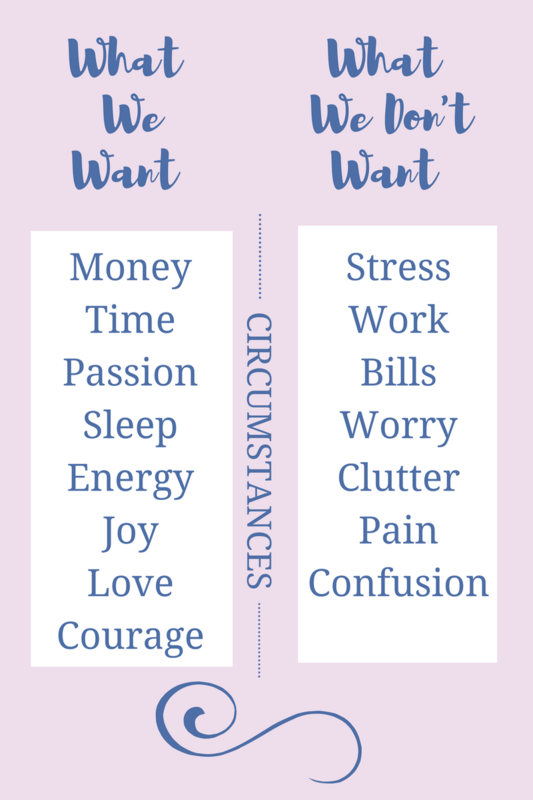 We began listing the things we want more of in our life and the things we want less of, identifying the positive and the negative. Stacey noted that somewhere in between lie our circumstances that can drive both sides of the line. She went on to illustrate that instead of making the choices that will get us closer to the positive side of the line we tend to check out and avoid them by doing things like eating too much, drinking too much, staying on social media too long, and buying things we don’t really need. Ouch. This sounds all too familiar to me. I’m pretty sure I’ve managed to do each of these to excess. Stacey impressed how we have to own our choices without shame or blame and move on. Whew, I did have that extra Girl Scout cookie! I loved her story as she described two different people driving to work one day. Negative Nancy and Positive Polly let’s say. She described the same negative events that occurred to both of them, but each handled it from a different side of the line, one reacted negatively and one kept a positive outlook. She illustrated how Nancy and Polly’s responses then rubbed off on another person, then another, then another as the day went on. It’s just like having a bad cold. We all know how quickly those things can spread. It’s the same with a bad outlook. “You’ve got to decide what really matters and then connect the dots to what’s most important”, Stacey said. “When you do, you’ll make decisions that support the positive rather than the negative”. It’s really how quickly we’re able to go back from one side to another that’s important. Being able to move through the negative more quickly will lead to spending more time on the positive side of the line. It often boils down to our relationship with our circumstances. Everyday we get to exercise the filter of choice. I can’t control what happens to me but I can control my response to it. Stacey went on to say that if you want to achieve your goals you have to be crystal clear on them. 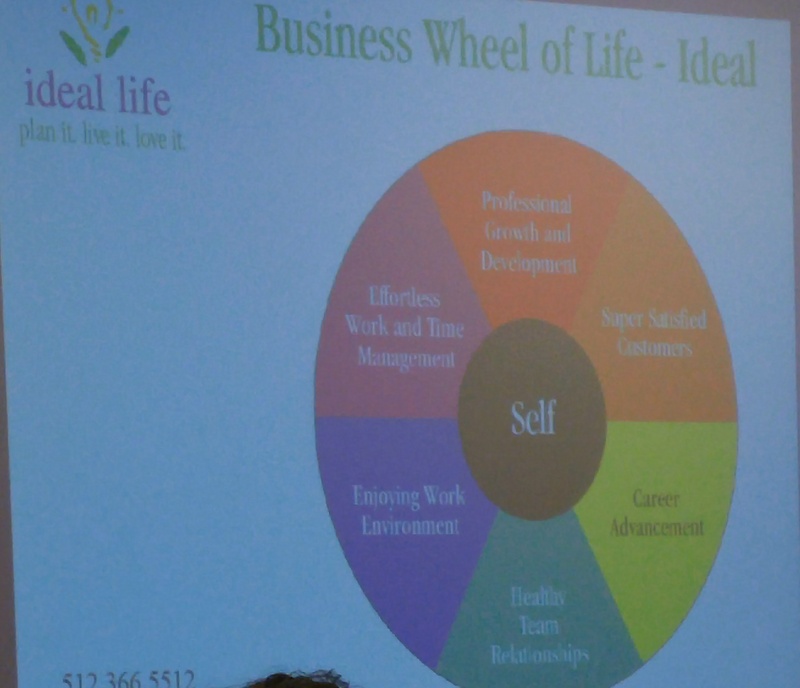 The last exercise for the night was a real eye opener when she had us draw out our own wheel of life based on where we put most of our energy, you know, the ole pie chart thing. I’m pretty sure I totally missed the point of this activity, but the size of my pie slices represented how I spend my day/time/effort. Woa! Really? There it was in black and white for me to see. I compared it to the answers to the questions above and the contrast was telling. This was an eye opener. This really gave me the chance to see where I could make changes. I don’t know about you, but I’d rather spend my time and money on things that matter and that will bring me more joy, peace, and happiness any day. What matters is the present. Dig deep and answer the questions above, then make your +/- list. This will help you get clear on where you’re headed. This talk was more than helpful, actually it sort of jolted me into some clarity in some areas of my life. I was reminded that only I am in charge of my attitude. I’m the only one in control of my perspective and outlook. It’s all about the choices we make. So go ahead, suit up, it’s time to get into the game. But stay clear of perfection. This can keep you from jumping fully in.